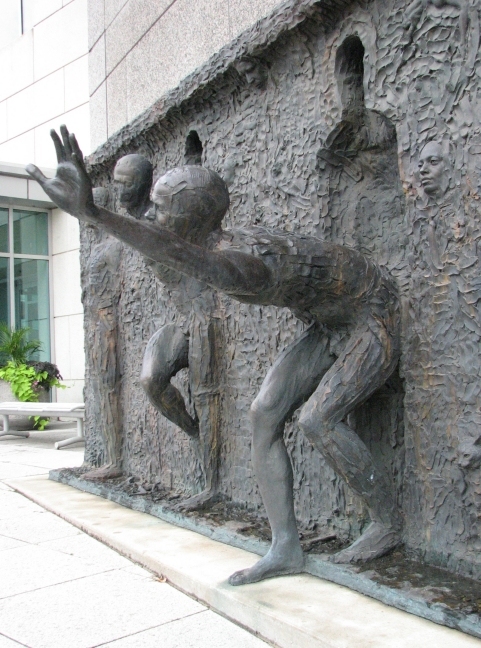 "I wanted to create a sculpture almost anyone, regardless of their background, could look at and instantly recognize that it is about the idea of struggling to break free. 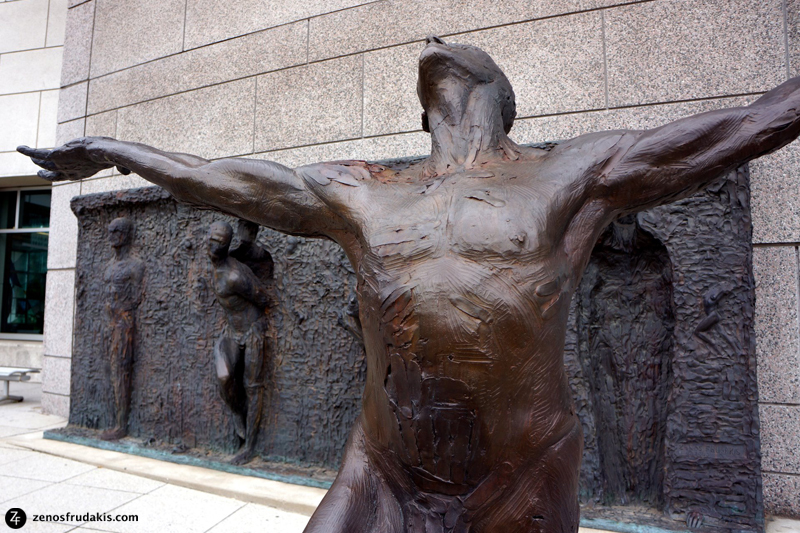 This sculpture is about the struggle for achievement of freedom through the creative process." Although for me, this feeling sprang from a particular personal situation, I was conscious that it was a universal desire with almost everyone; that need to escape from some situation—be it an internal struggle or an adversarial circumstance, and to be free from it. 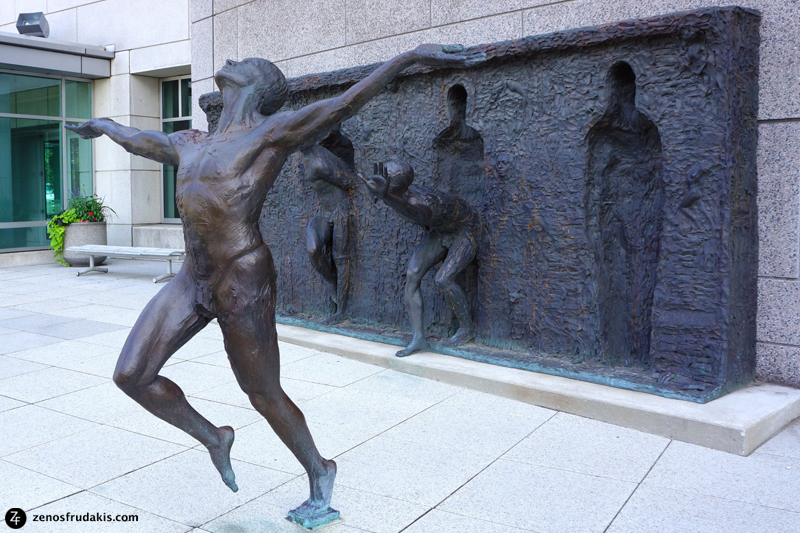 The Freedom macquette was created to develop the initial concept of the sculpture. 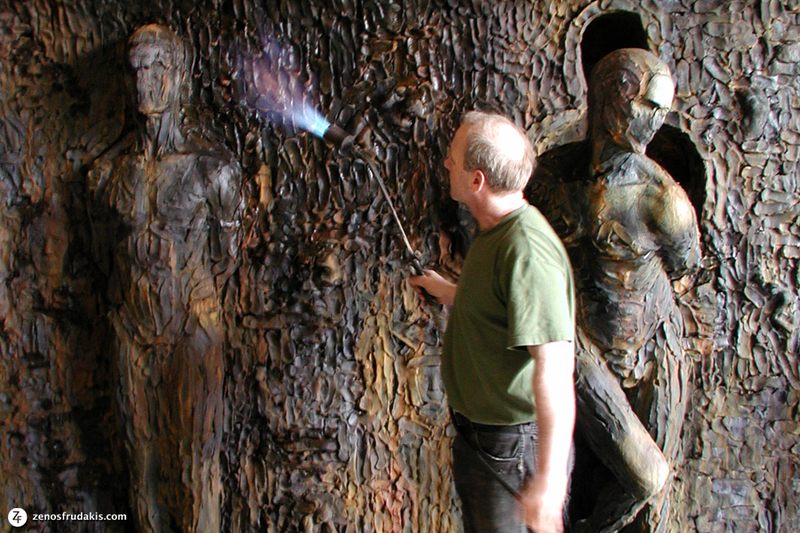 Larry Welker, President of Laran Bronze Foundry, develops the patina. 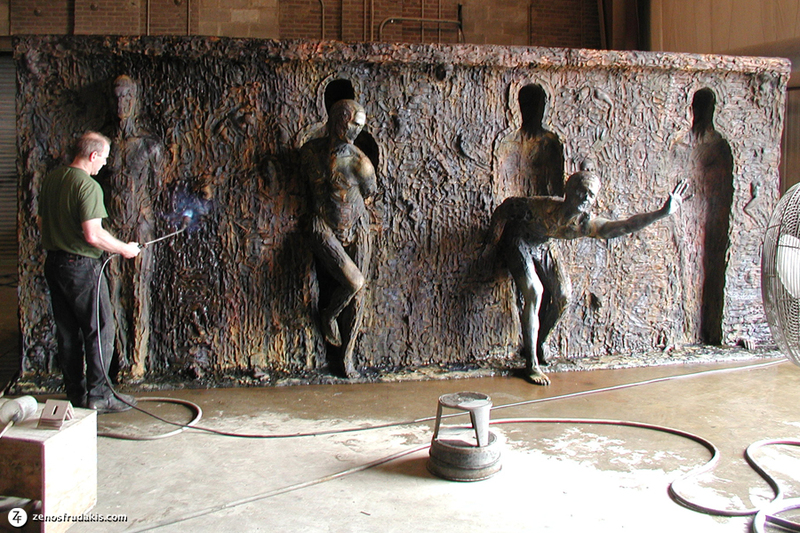 The Freedom sculpture was cast at Laran Bronze Foundry in Chester, Pennsylvania. 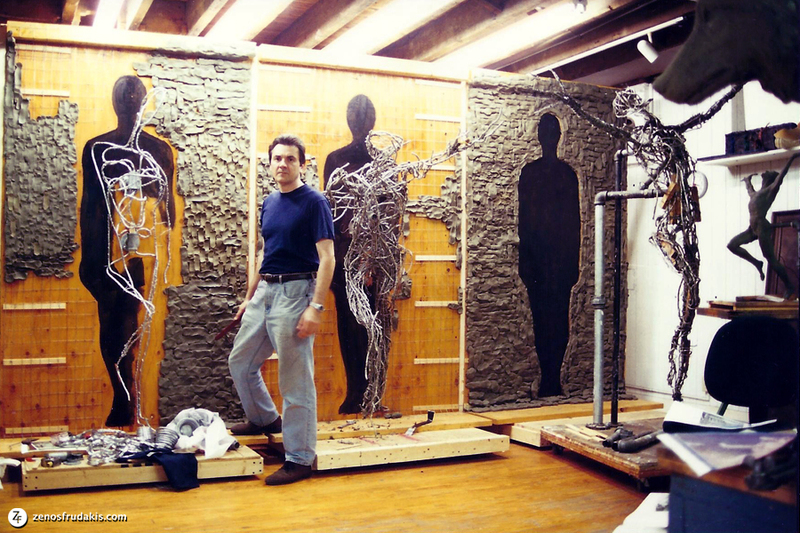 In working on the large scale sculpture, I was satisfied that those who drove by getting a quick look at it would see the big picture: that it was about escape. I was also concerned that those who worked in the building and who passed the sculpture frequently would have something more to see. 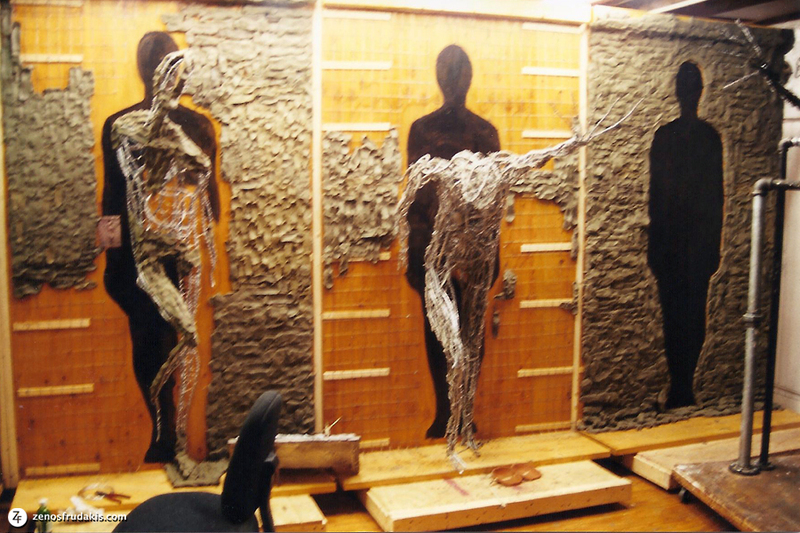 There was a lot of empty space between the figures on the wall, which I saw as an opportunity to develop further ideas. 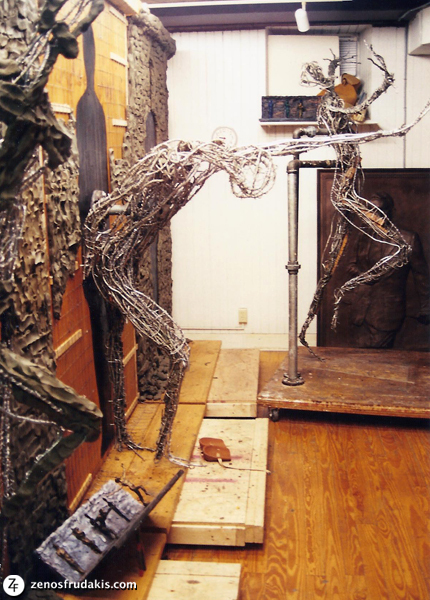 It was important to me that the sculpture have more than one theme going on at once. 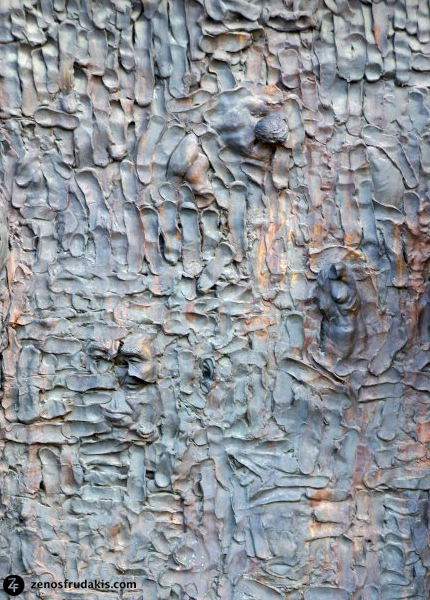 One of the other major ideas incorporated in the work is that the very process of creating the sculpture is clearly revealed in the work itself. 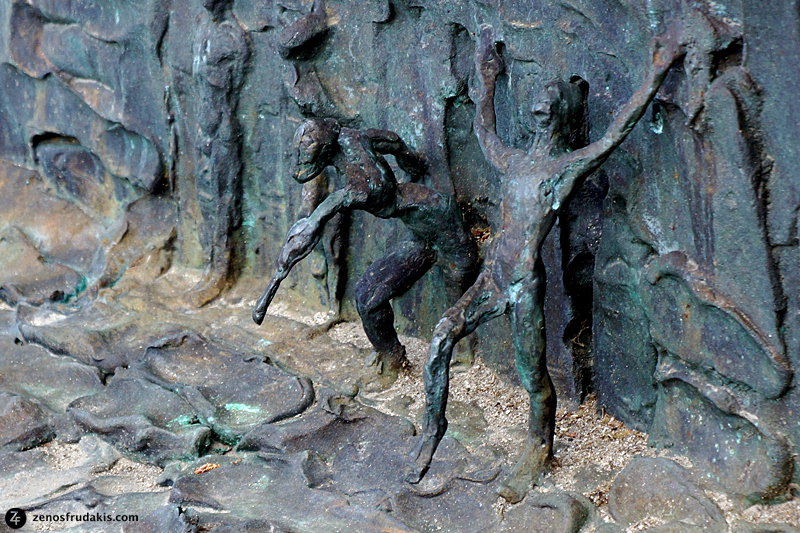 The maquette is cast into the sculpture in the lower left hand corner. 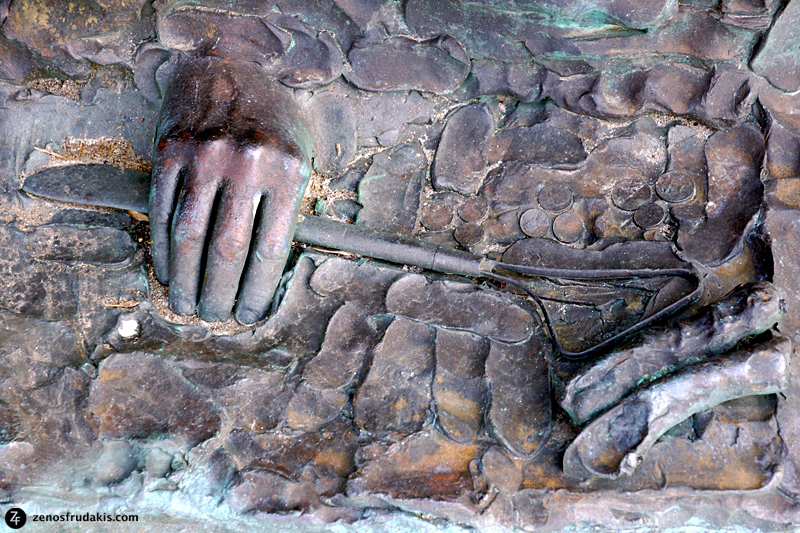 In the lower right corner is the cast of the sculptor’s hand holding the sculpture tool with two rolls of clay also cast in bronze. 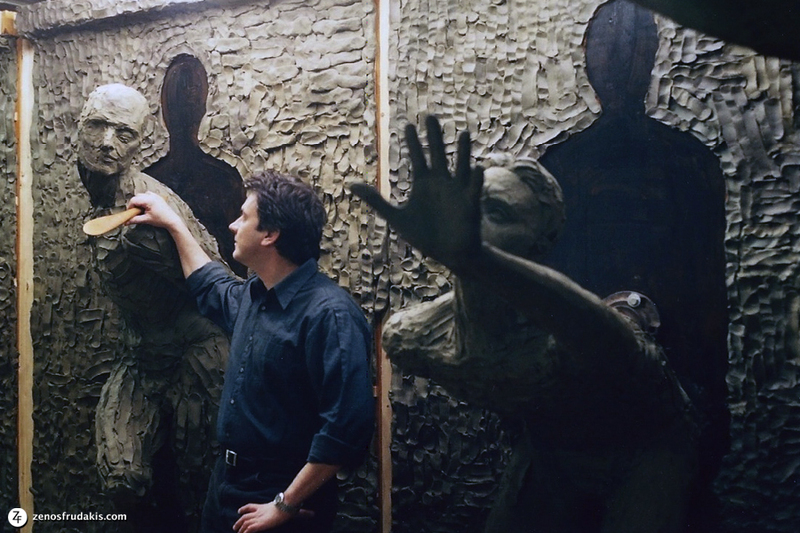 Throughout the background of the Wall, I have rolled out the clay and pressed it with my fingers so that my fingerprints are all over the sculpture. I have not hidden how I have made the piece. In fact, the whole idea of the macquette is enlarged so that all the figures in the background look like a giant macquette. 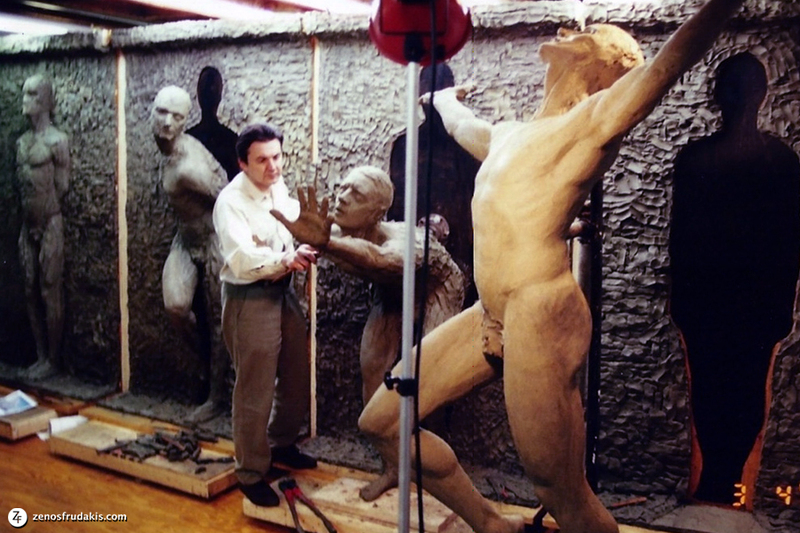 And at the same time, as the figures move from left to right, I have shown how figures are developed when you are sculpting from the rough to the more finished product. 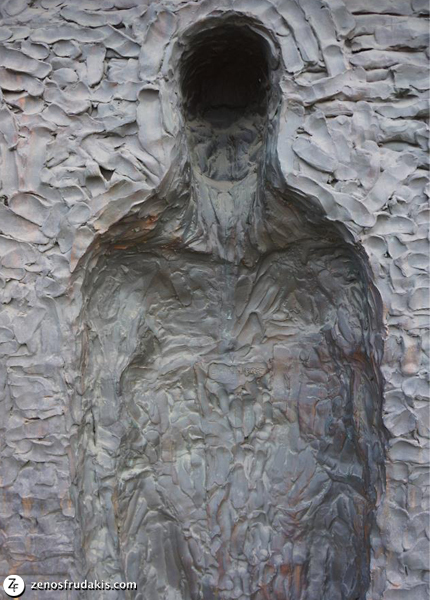 Also cast into the sculpture is an anatomical man, traditionally used as a reference by sculptors. 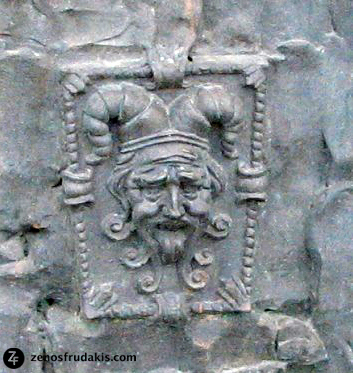 Many of the heads and figures on the wall, some in the round and some in relief, are shown partially sculpted, revealing the process of creation. 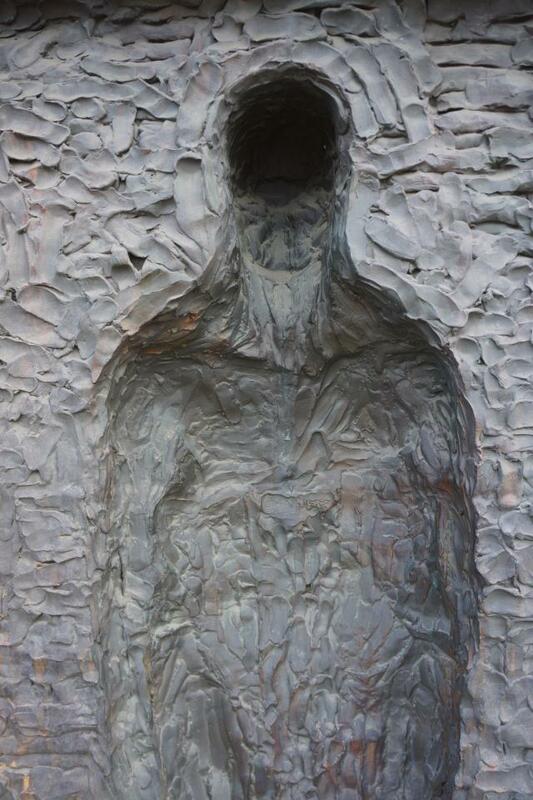 Something else I have done with the sculpture is that I have created a one man show of my work. I have always admired Rodin’s Gates of Hell. 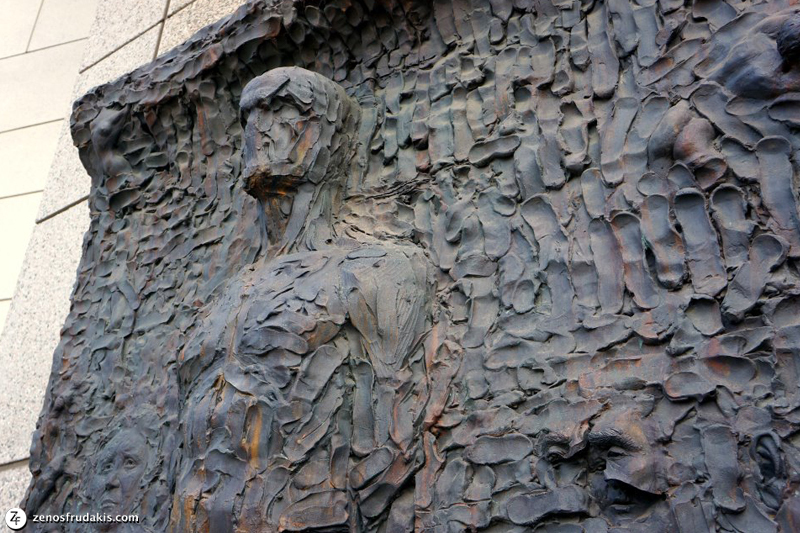 I similarly thought I would incorporate many sculptures into the wall where it was suitable. Like T.S. 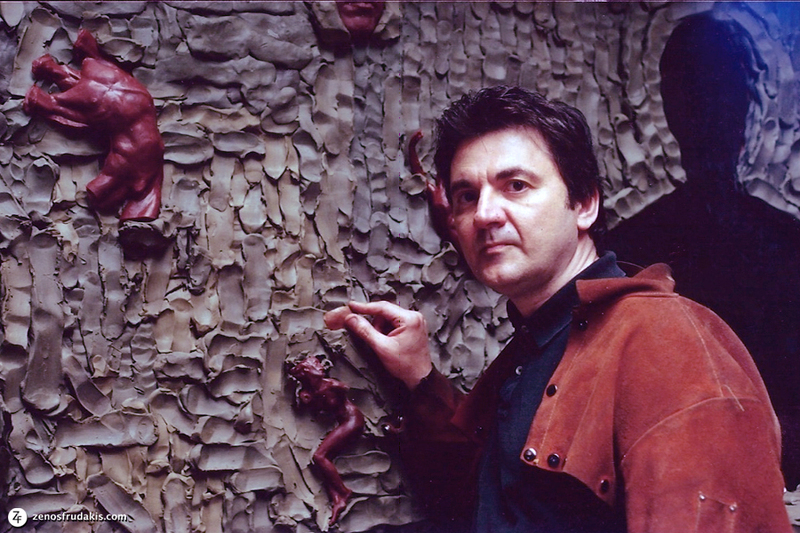 Eliot and other artists, I have put many personal elements in my work. 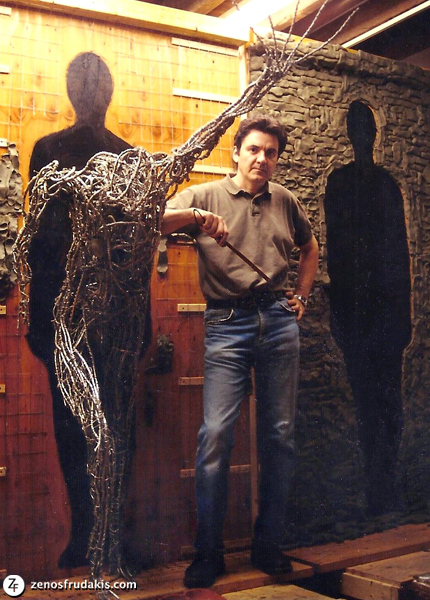 My friend Philip, a sculptor who died of AIDS, created a work that I included in Freedom because he often expressed his wish to have it in a public space. He did not live long enough to accomplish this himself. 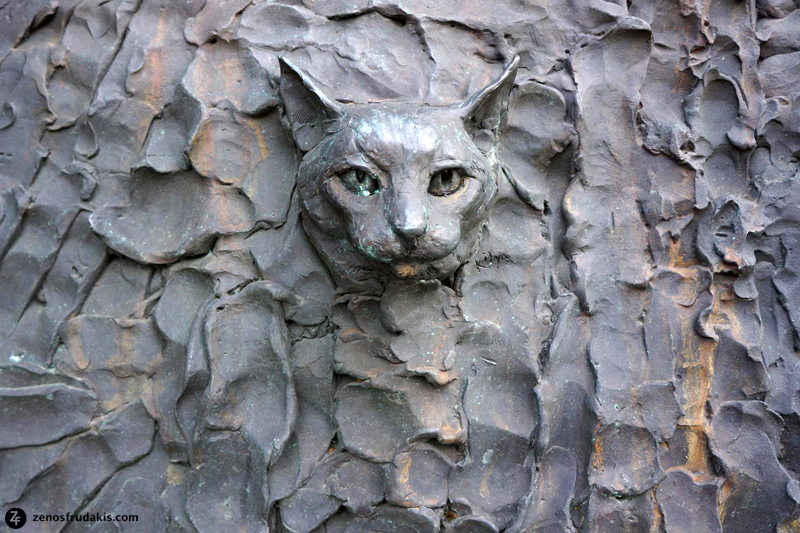 My cat, who lived with me for 20 years, my mother, father, and my self portrait are in the work. It is obvious which face is mine because there is a ballooned phrase coming from my mouth with the word “freedom”, written backwards, making it clear that the face was sculpted in a mirror. 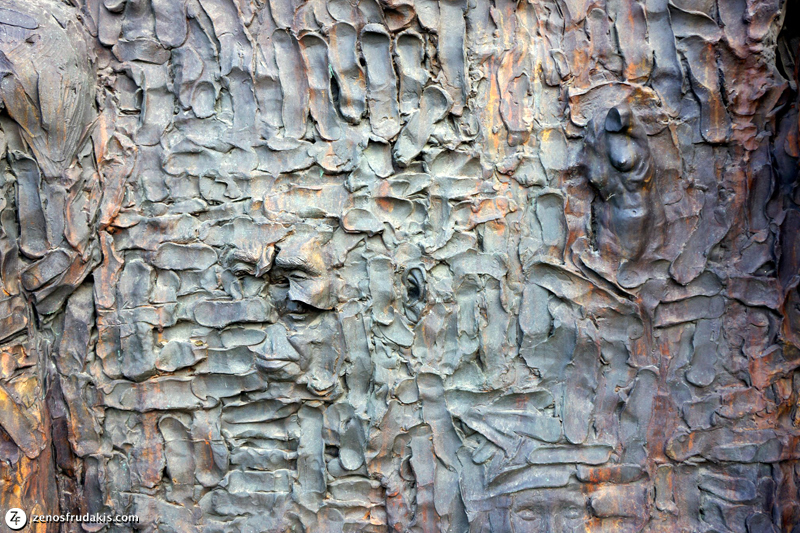 I see the whole Wall sculpture as a kind of illusion akin to Alice’s Through the Looking Glass. 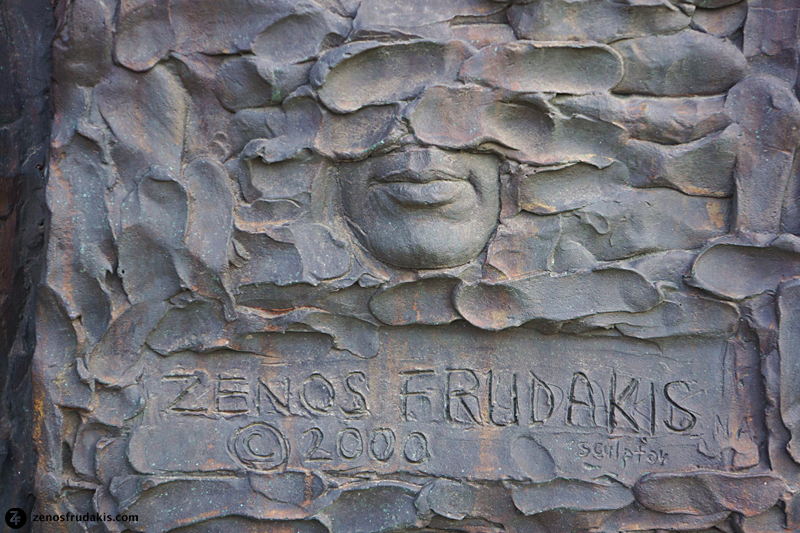 Sculpture by Duane Hanson of Zenos' hands is integrated into the Freedom sculpture. 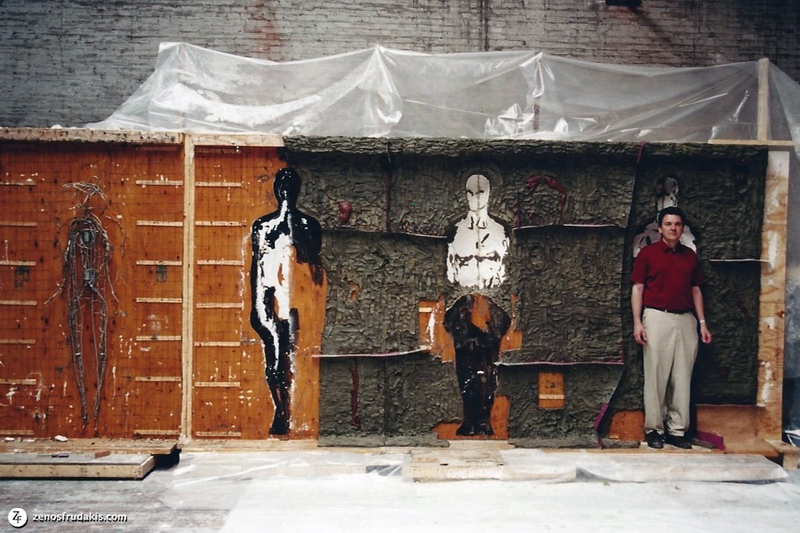 The sculpture contains an original Duane Hanson— a bronze cast of my own hands that Duane cast for me as a gift. Much of what I did with this sculpture has to do with taking traditional forms and combining them in non-traditional ways, forming a postmodern sensibility. For example, I dropped a wax cast of my father’s bust from two or three feet in height so that it broke into large pieces. 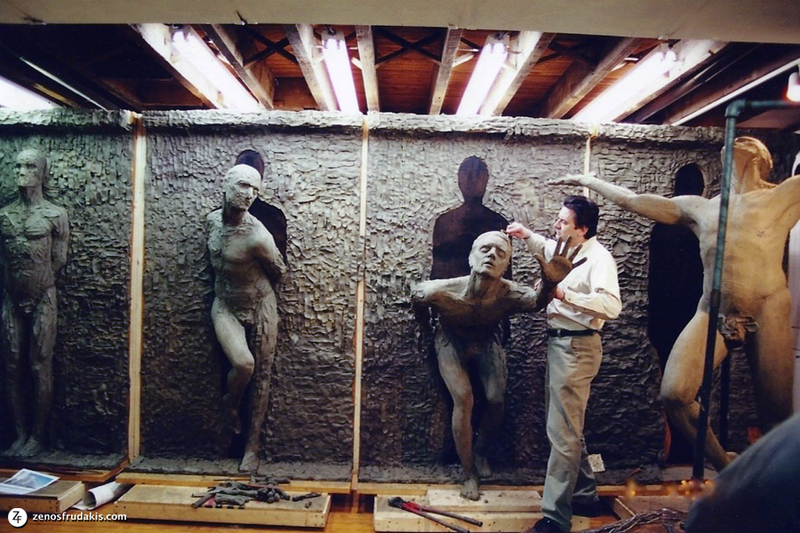 I cast those into the wall in a fractured manner over another face, an old work I found in a vat of clay purchased from a sculptor who had long ago died. 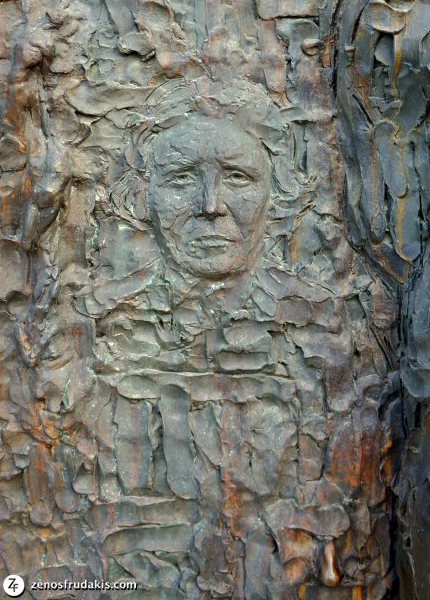 I have hidden many things in the background for people who see the sculpture more than once to discover, such as a cast of coins—a nickel and two pennies, another nickel and two pennies, and two quarters and a penny. These represent not only the relationship between money and art, but the numerals 7-7-51, my birth date. It is important to me that the public interact with the sculpture, not just intellectually and emotionally but physically. 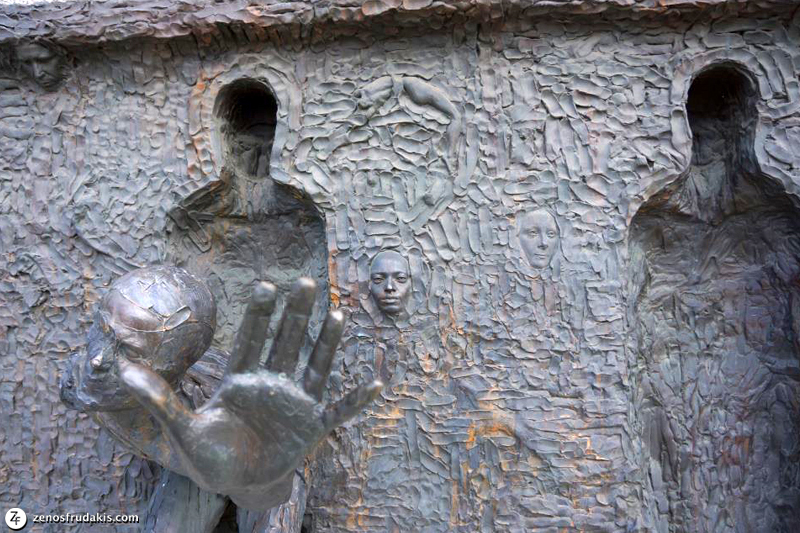 I have created a space in which I have written “stand here” so that people can place themselves inside the sculpture and become part of the composition. In the end, this sculpture is a statement about the artist’s attempt to free himself from the constraints of mortality through a long lasting creative form. The following are a few of the hundreds of emails and online comments we have received about the Freedom sculpture—representing the diversity of content and locations. All of the messages have been read, and each is respected and valued. 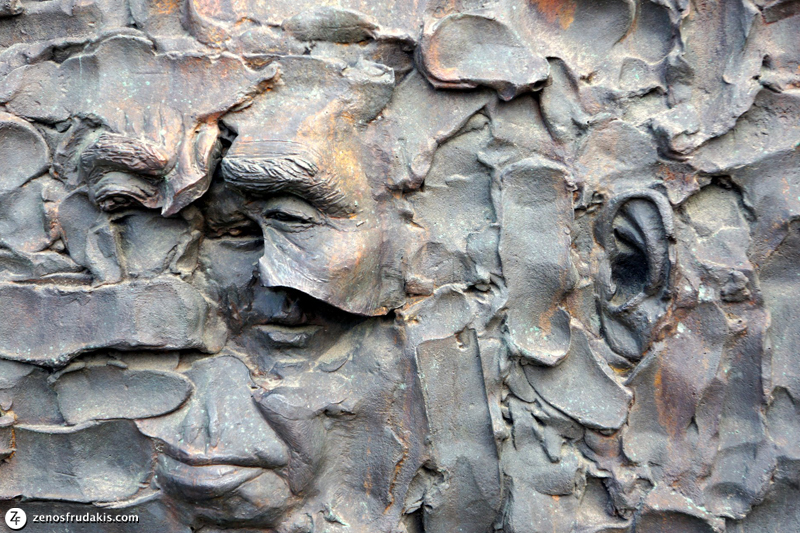 The personal comments reveal both the universal qualities represented by the sculpture as well as the unique life experiences of each person. 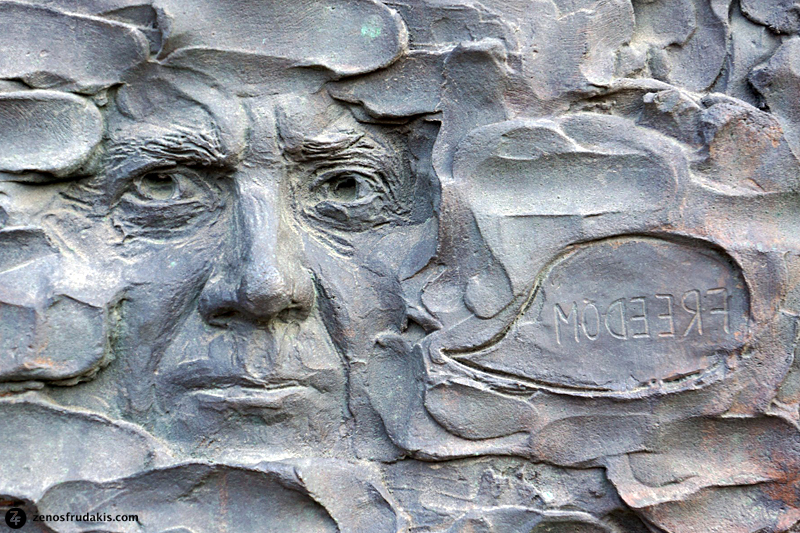 Your messages continue to give shape, meaning and new dimensions to the Freedom sculpture. “In Philadelphia everything breathes free. Not only is the Liberty Bell here. 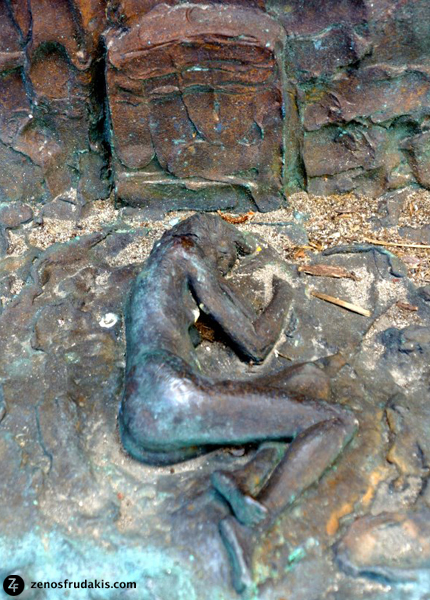 In 2000 sculptor Zenos Frudakis glorified freedom by showing bronze people trying to tear themselves away from the wall of a building. 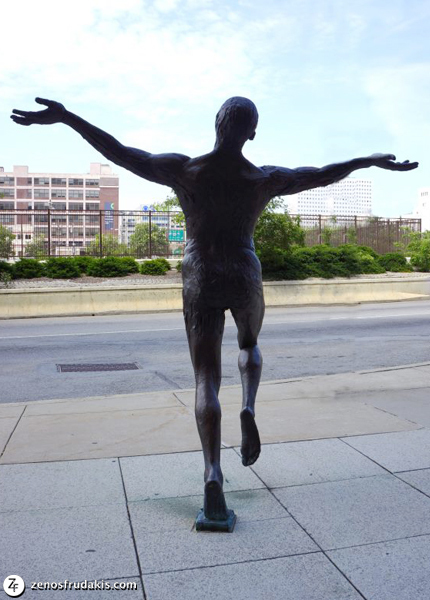 In fact, the urban sculpture depicts one man who step by step is separating himself from a gray mass of faces, arms, and legs. Until today, I had never encountered your work. I am in public education in the San Francisco Bay Area. I saw "Freedom" via a Facebook post, and was simply enthralled... Simply put, it is all amazingly creative, awe-inspiring and breath taking. 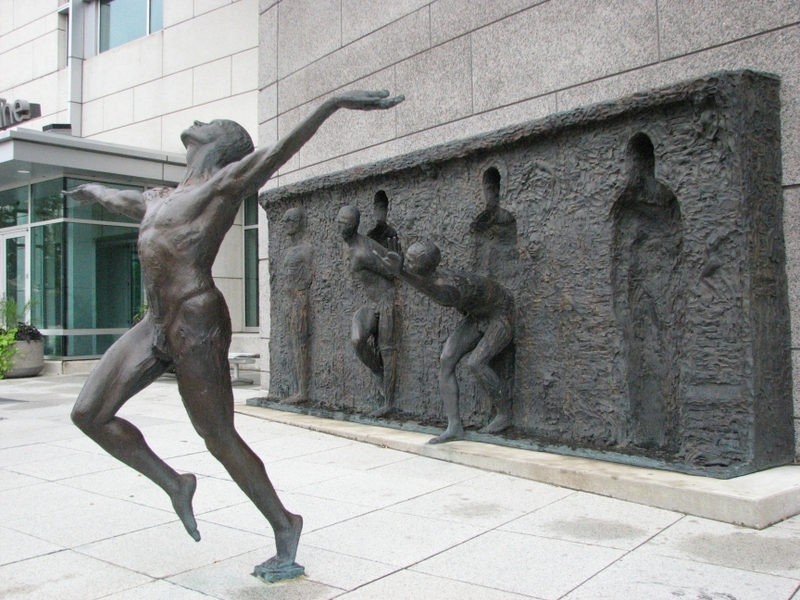 I just discovered your Freedom sculpture (on the internet). And I am left speechless by its incredible power and uniqueness. I am in awe, that a human being managed to capture and express the Human Spirit and Struggle in such an intense, profound, dynamic, and tangible way - AND all this in a sculpture, which, by definition, is static. I just want to congratulate you about your work. When I saw “Freedom” I stayed with my mouth open for almost an hour. I live in Athens and in this difficult for our country time I felt so proud for you.